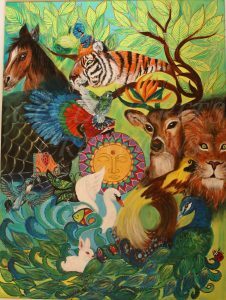 It’s all about ‘’how I see Wildlife and nature in my eyes’’ & how one form leads to another. 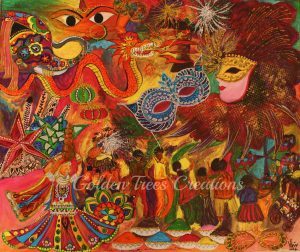 I still relish this memory how I won an online competition in 2014 with 750 votes on facebook with all ur support on Handmade N Beyond.Thoughts flow-in when you utter “ Holi Carnival” & one can see the plethora of celebrations in my one-of- a-kind painting. One can find the following : Holi Festival- Festival of Colours, Carnival – Masks, Rajasthan’s Desert Festival Dance by a multicoloured dressed girl, Govinda (breaking the pot- can be seen above the rangoli) during Krishna Janmashtami, Christmas’ Stars, Mehndi is usually a pre-marriage festival celebrating with a bride and her family, friends, Elephant Festival of Jaipur, Durga Puja, Lantern Festival of China, Dragon Boat Festival of China, Dussehra-Festival of Lights (Can be seen with the Ravana burning by an arrow, Crackers on the sky and with karthigai deepams) & Village Festival in India (One can see the Ferris Wheel, Kids with balloons, Shops). All these are interlinked by a common name “FESTIVAL”, which in turn spreads happiness and living with our tradition. We all assure to make these live for all Generations.